An Oxford anthropologist has warned that the world's only venomous primate is under threat from the pet trade. The slow loris is nocturnal and native to south-east Asia. They secrete venom from their elbows, which they mix with saliva resulting in a toxic bite. Videos of the creatures as pets have attracted millions of hits online because of their cute appearance. 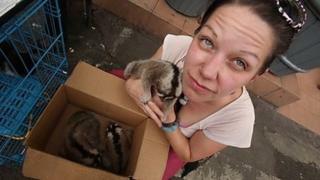 Dr Anna Nekaris, Oxford Brookes University primologist, said growing numbers were caught for the pet trade. She said they were easy to catch because they often slept in the day and did not run or leap very far. On a recent trip to Java to study the primate, Dr Nekaris noted that an increasing number of slow lorises were being offered for sale at markets. But she found they were becoming a rarer sight in their native forest homes. Dr Nekaris said: "Most of the animals that get into people's homes as pets are wild animals. "They aren't captive bred and it's a real dark pathway through which they have to go to get there. "In order to get into someone's house, the animals have to go through a lot of cruelty and suffering in order to be pets and that's really decimating the population. "The real threat to the slow loris is that in order to avoid being bitten [pet traders] pull out the loris's teeth with pliers or nail clippers. "So the animals, once they're in the trade, they can't be reintroduced to the wild because they have no teeth." Those that are rescued from the pet trade without teeth would not be able to feed properly or fend for themselves. Despite it being illegal to catch lorises and to keep them as pets, the law is not being enforced. They are also used for traditional medicine. Dr Nekaris's work is featured in a BBC Two documentary to be shown later. She added: "The whole film was always a worry - 'Are we going to see it? Are we going to find it? - Because they are critically endangered primates. "There was a fear that we'd never even see one in the wild [during filming]. "We knew that we would see lots for sale in markets where they are being sold openly as pets. "The conservation side was very easy to film because they're so prevalent in trade and rescue centres, but the science side was harder to film because there are so few left in the wild." Jungle Gremlins of Java is on BBC Two on Wednesday 25 January at 20:00 GMT.